Here we are, in our eleventh day without sunshine, with no end in sight. Thankfully, we are not flooded, like many places, just damp and in dire need of some sun. I know the sun will eventually shine again, in due time. In the meantime, I’ll try to wait patiently. All of the days have been pretty much the same around here. We eat, we sleep, we watch some of the new fall shows on television. Ed vacuums the house, while I dust. Sounds exciting, doesn’t it? Fortunately, all of last week wasn’t like that. On Thursday, Ed and I broke our usual routine by taking our daughter and granddaughter out for lunch. It was our daughter’s birthday, and we thought it would be nice to do something special with her. We all enjoyed our lunch, and the shopping that followed. Unfortunately, a thunderstorm blew up during the shopping part of the trip, and we got stranded in Kmart for a while. Ed and I walked over to the furniture section and made ourselves comfortable until the registers were back up and running. I tell you, older folks know how to adapt! Ha! On Friday night, our entire family gathered at the house to visit and celebrate our daughter, Brandy’s, birthday. Ed grilled hamburgers and hot dogs for all. My daughter-in-law bought birthday decorations, and decorated the kitchen for me, since I’m still not feeling 100%. She also took down the decorations after the party, and I was very appreciative of her help. We did a little something different at Brandy’s birthday celebration, this year. While sitting around the kitchen table, we took turns offering up praises to Brandy for the things we appreciate about her. It turned out to be a special time, consisting of some laughter and a few tears. We shouldn’t wait so long to tell our loved ones how much they mean to us! In addition to Brandy’s birthday, our youngest son, Brad, was celebrating the official sale and closing of their house in the city, on Friday. It’s been a long 5 months since he and his wife first put their home on the market. They’ve been living with Jennifer’s dad and step mom for four of those five months. As of last week, Brad, Jennifer, and Evan are living on their own, once again. Perhaps life is finally returning to normal for them. Saturday evening brought us an overnight guest. Granddaughter, Madison, was finally able to spend the night with us. She’s been begging to stay with us for ages, but we put her off because I wasn’t feeling well. An opportunity presented itself, and it finally seemed like a good time to let her stay over. Ed and I ordered pizza, letting Madison choose her favorite kind. Later, we all watched movies until 11:30 that night, like a bunch of kids! Today makes three weeks since I had my back surgery. Sigh. When people ask me how I’m doing, I answer, “I’m better than I was, but not as good as I’d like to be.” I don’t know why, but, lately, early mornings have been difficult. When I first rise out of bed, I can barely walk down the hall. I have pain in the left hip/groin area, similar to sciatica, but it doesn’t radiate all the way down my leg like before. It stays confined to the thigh area. After a couple of hours, the pain subsides, and I can walk again. It’s very strange. Many of the strange leg ‘sensations’ I was experiencing, at first, have subsided, so I’m hoping and praying this will, too. Share It With You Sunday…What A Weekend! We had a busy weekend here in Gooseneck–but it was a good weekend! 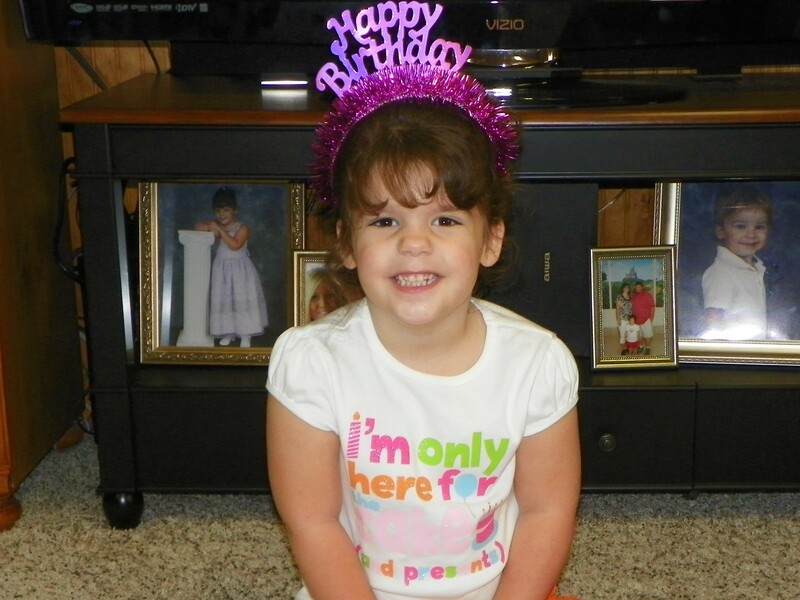 Our little granddaughter, Madison, turned four on Saturday. We spent the weekend celebrating–and I do mean the entire weekend! Now I know that all grandkids are special, but Madison is a wee bit more special to us for several reasons. First of all, I wanted to be a grandma for five long years before Madison ever arrived. Then when our daughter and her husband finally decided to try to conceive–it took quite a while (15 months)– and they had to have a little help(fertility drugs). Once Madison was conceived, it was a problem pregnancy–bed rest almost the entire time–ending with an emergency c-section delivery! By now I guess you’ve got the idea…Madison didn’t come easy. …How the attending physician suddenly changed his mind about doing the c-section after the nurses at the hospital convinced him that it wasn’t necessary! Now that I’ve remembered and written all that we experienced trying to get Madison here– I’m tired! Actually, I am tired from two days of partying and celebrating with her–but I wouldn’t trade a minute of it for anything! Like the old song says…Thank God for kids–and grandkids! 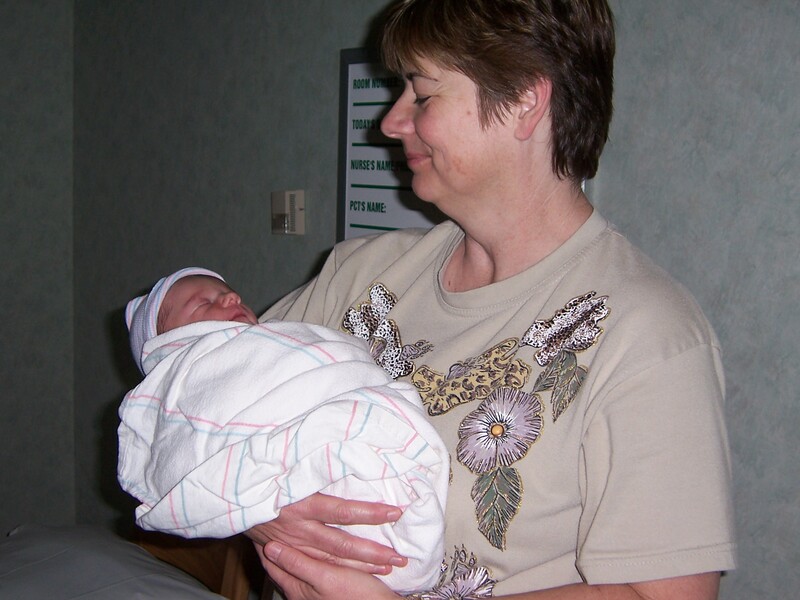 I’m including a photograph that was taken of me when I held our precious granddaughter for the very first time…Can you see the look of relief and joy on my face? What a moment! I am not ashamed to tell you this– I sat in that hospital chair and held that little bundle of joy the entire night, while her exhausted parents slept. That was as close to heaven as I’ll ever get here on earth…Happy Birthday, Madison!